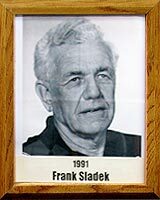 As the indomitable head coach at the Arizona School for the Deaf and Blind (1951-82), Frank had, at various times, coached six-man football, basketball, baseball and cross-country. During his incredible 30-year career (he hung up his track shoes and whistle in 1982 to return to full-time teaching in the science department), Frank guided the ASDB Sentinels to four state Class C titles and 13 division titles in track. He was the Silent Worker’s (national magazine for the deaf) Basketball Coach of the Year in 1952, the year his team won the southern small schools title. Frank graduated from the Berkeley, Calif., School for the Deaf and Gallaudet University in Washington, D.C. At Berkeley, he played football and was selected as Deaf American Schools’ end and made the Silent Worker’s All-American team in 1940. He also was a dogged competitor in basketball and track and field, winning four conference championships in shot put and discus (1938-41). Frank served as vice president and secretary-treasurer of the Farwest Athletic Association of the Deaf. “Mr. S” was inducted into the American Athletic Association of the Deaf Hall of Fame in 1985.